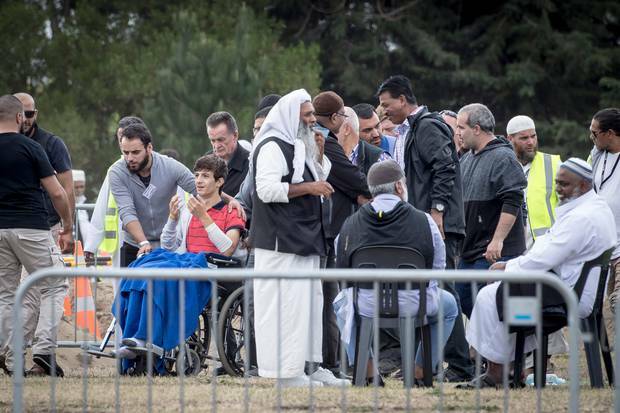 A survivor of the Christchurch mosque shooting looked on from his wheelchair as his father and brother were buried this afternoon. Zaid Mustafa was praying with his father, Khaled, and his brother, Hamza, when the Deans Ave mosque was attacked. The 13-year-old was badly injured when a gunman stormed into the Al Noor mosque on Friday – opening fire indiscriminately on worshippers. Khaled, 44, and Hamza, 16, died in the massacre. As the bodies arrived at Memorial Park Cemetery, silence descended over the already quiet scene. Hundreds of men, women and children gathered in the hour leading up to the service – some hugged, others reflected. Two of the 50 killed were current students of Cashmere High School, Year 10 student Sayaad Milne and Year 12 student Hamza Mustafa, his younger brother Zaid was injured. Funeral attendee Jamil El-Baiza told Newshub Zaid wanted to stand but he was unable. “The son wanted to stand. He couldn’t. He tried and couldn’t. A wound in his leg wouldn’t allow him too,” he said. Meanwhile, another attendee and friend of Hamza said he would miss him very much. “He was really good at sports, he was good at everything, like horse riding, fishing, sprints, everything,” the friend told Newshub. Cashmere High School principal Mark Wilson said students and staff were holding up remarkably well under the circumstances. “We’ve received large numbers of flowers, we’ve received a lot of comfort food and we’ve had a lot of requests of how to support the two families in particular where they’ve lost their sons,” he said. “We’ve had people specifically say they’d like to support these two families, especially within our school community. The account has reaped in around $7,500 within the past two days and the school will communicate with the families about how they’d like it to be spent. Instead of a mosque there was a marquee for the burials. Muslim funeral services, known as Janazah, are usually held in mosques and strict protocol is followed. However that is simply not possible in Christchurch after the tragic events that unfolded on Friday. Instead of privacy to farewell and mourn, the world’s media had been invited and were watching from across the road. Khaled and Hamza began their final journey at a Christchurch funeral home, then were carried in a white van escorted by police, across the city they loved and called home, to their final resting place. Their shrouded bodies were contained in simple open boxes and carried aloft, high above the heads of their loved ones, into the marquee. Wilson said the school would continue to offer support to the victims of the massacre and the students and staff also affected as a result. He said the Cashmere High School community are “quite fatigued” but having the support of the country and people internationally has been appreciated. The principal also said he was “really heartened” by how the students have handled themselves following the attack. “As a school principal, I feel really heartened with how our kids have responded and I think our future looks really bright,” Wilson said. “We make a point within our school community, like all schools, we talk about our values and every school has their set of values.